Have you looked at what it actually takes to get to outer space? It's pretty daunting. If you want to become an astronaut, you have to meet the height and weight requirements. Then you'll be expected to withstand many hours of physical and mental exhaustion tests. If you decide that's too much, and just try to get to space on a private ship, you can expect to pay well over 15 million dollars, which, we don't know about you, but none of us have laying around in our couch cushions. Seems like for anyone who really wants to adventure into space. you're stuck with either watching lots of outer space documentaries on your 4k TV, or you can use your imagination. The nice thing about your imagination is, it's free, first of all. It doesn't have any limits so you can travel outer space wherever and whenever you want. Also, if you add this Plus Size Astronaut Costume to your imaginary play, it might seem even more real! This pretend NASA uniform is 100% polyester poplin fabric. It has a center-front zipper with rib knit sleeve cuffs and an elastic back waistband with ankle cuffs. It has embroidered patches on the chest and sleeves, with pockets on the chest, legs, and sleeves. Webbing straps have parachute buckles to resemble a safety harness. 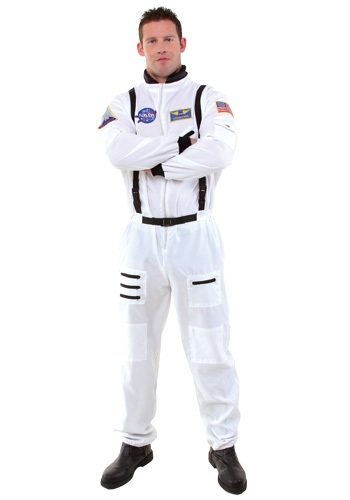 This costume is also available in standard sizes, so everyone can get in on the outer space action!